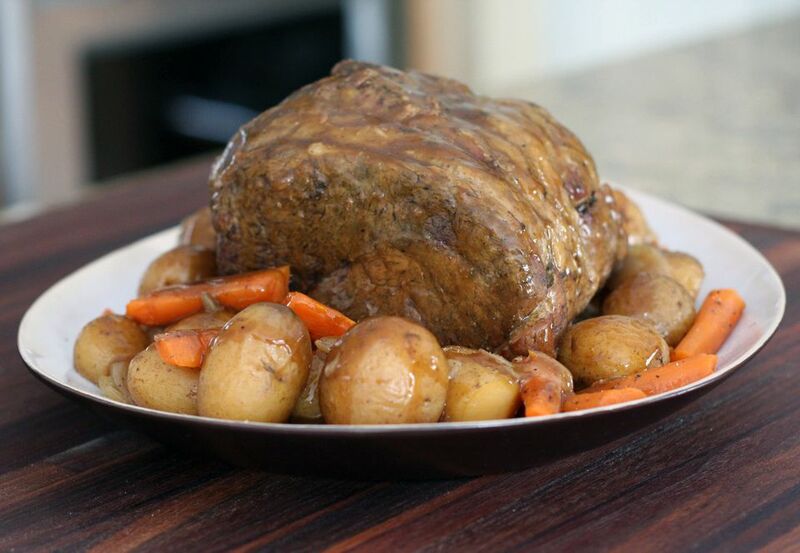 This pot roast is a simple preparation, yet it offers amazing flavor. With a variety of vegetables and straightforward seasonings, it's a complete meal in one pot. The slow cooker is the perfect appliance for a pot roast, and it doesn't heat up the kitchen the way the oven or stovetop does. As with many slow cooker recipes, it's easy to adapt the dish to suit your tastes. If your family isn't fond of carrots, replace them with parsnips or chunks of rutabaga. Or add more potatoes to the pot. For extra color, add some frozen green beans or mixed vegetables about 30 to 45 minutes before the pot roast is ready. Serve the pot roast and vegetables with hot baked biscuits or crusty bread for a tasty and satisfying family dinner. Sprinkle the pot roast lightly with Kosher salt and pepper. Heat the olive oil in a large skillet over medium-high heat and sear the pot roast on all sides. Add the onions and continue cooking until onions are just beginning to brown. Put the potatoes, carrots, and garlic in the slow cooker. Add the browned roast and the onions, along with the thyme sprigs or dried thyme. Combine the beef broth with the Worcestershire sauce and pour over the roast and vegetables. Cover and cook on LOW for 9 to 11 hours, or on HIGH for about 4 to 5 1/2 hours. Remove the roast and vegetables to a platter and keep warm. Strain the remaining broth and let stand for a few minutes. Skim off fat. Or, use a gravy separator to skim the fat. Put the juices in a large saucepan and bring to a boil. Boil for about 10 minutes, or until the broth has reduced to about 1 1/2 to 2 cups. In small bowl, combine the cornstarch and water. Stir in the cornstarch mixture and cook until thickened. Stir in the butter. Taste and adjust seasonings. Drizzle some of the sauce over the meat and vegetables and serve the rest at the table. Tougher cuts of meat are ideal for long, slow cooking. They have lots of connective tissue which breaks down and makes the meat tender and succulent. Choose a cut from the chuck, such as the chuck arm, 7-bone, blade, or chuck eye. Other excellent options include the beef brisket (not corned), rump roast, or bottom round.